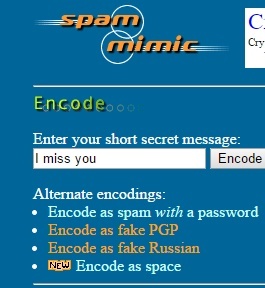 Spammimic website has started an easy way to encode private message into Fake Spam message. You can encode or decode messages. Encryption is easier now. If you want to send a short message, you can use the different encoding versions and encode you message. The message will be encrypted into a normal message and your friend whom you are sending the message can decode it from Spammimic. mail is being sent in compliance with Senate bill 1623, Title 1 ; Section 309 . This is a ligitimate business proposal. Why work for somebody else when you can become rich within 99 DAYS . Have you ever noticed nobody is getting any younger plus people love convenience! Well, now is your chance to capitalize on this. We will help you SELL MORE and increase customer response by 100% ! You can begin at absolutely no cost to you. But don’t believe us! Prof Simpson who resides in Tennessee tried us and says “My only problem now is where to park all my cars” ! We are licensed to operate in all states ! We implore you – act now ! Sign up a friend and you get half off . God Bless !